There are many adjustments you must be making in life. I'm sure some are easier than others. Yes, these restrooms are a wonderful thing!! And you are very wise to take Walter with you!! Those must be one of the most wonderful additions to our society! You know I never thought about family restrooms being for adults who needed help from a spouse. I always thought it meant parents with children. You have opened my eyes. Those rooms now receive greater respect from me. We never know what we may end up being thankful for! Yay for family restrooms--and helpful husbands during difficult times. and you never know what you will miss until you miss it. I guess I'm talking about the toilet here. 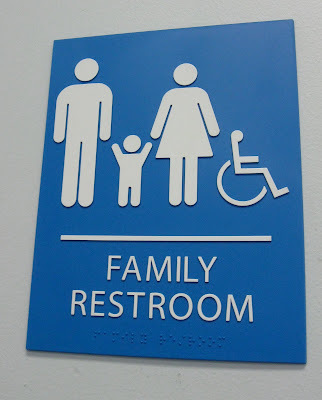 Haven't ever heard of Family Restrooms, but what a good idea. The restroom was one aspect I hadn't really given any thought to. I can definitely see the value of a family restroom. I guess I also was thinking more of children and parents. You have a honey of a husband. So happy you are getting around more and more. My wife suffered a ruptured brain aneurysm last winter she wnt back to work fulltime in April and now, she works all day at a fast-paced executive job and plays tennis three days a week . The will to live fully and with verve is within us all. Some just don't summon it when the chips are down.